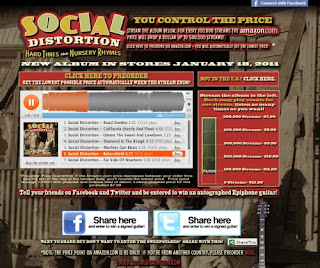 Neat marketing campaign from Social Distortion this morning, their new album Hard Times and Nursery Rhymes will be launced for sale at Amazon on Jan the 18th BUT the price hasn't been set yet. Depending on how many people preview listen to the tracks, before the sale date, determine how cheap the album will be ($1 reduction for every 100,000 listens-max $5 reduction). Another interesting point, they are using SoundCloud for the previews (its a USV funded startup that i only just heard about recently), basically you get to add comments at any place during the song. Re the new album, didn't like it first listen but only because i was expecting the hard driving old Social Distortion (first 30 seconds of the first track starts out great but then it gets middle aged and "ballady") - 3 full listens through later to the whole album its starting to grow on me and i'll be buying it anyway as i'm a huge fan but i have to wonder if Lanie Kerrigan would still dance around to it wearing nothing but a tshirt. Maybe we're all just getting old.